If you need a few fabulous camping gear gift ideas for the hunter, hiker, mountain biker, or other type of outdoorsman in your life – we’ve got you covered! When you or your beloved outdoorsman is out in the elements, you need the essentials: tent, head lamp, water filter, bike tool, baby carrier, wireless stereo, solar light, two-way radio and other items. Packing the right gear is the best way to ensure a trip into the outdoors will be a memorable and enjoyable one. If you want to start your holiday shopping list early this year it is important that you know which outdoor items are worth your time and money. Before you buy any outdoor items, camping supplies or emergency survival gear, consider this list. These 10 items are a great starting point for your outdoor experience and are the highest-quality pieces for your trips into the great outdoors. They are all fantastic finds for activities like hiking, fishing, mountain biking, camping and any others that you enjoy. The best camping checklist includes items that make all aspects of your outdoor experience more comfortable, convenient and safe. While everyone’s trip into the wilderness is different, there are some items that are more important than others. Many of the items on this checklist are lightweight and compact so that you don’t waste space – and that can be the difference between taking all the gear you need, and leaving some behind. If you or someone you love prefers the warm glow of a campfire to the bright lights of the city, you will need to seek out the highest-quality outdoor gear to help them transform remote locations into a place that feels like home. Outdoorsman gifts can be difficult to shop for but with this list, it just got easier! Specific Features: Optimized geometrical shape, non-tapered floor, easy-entry D-shaped StayDry™ door & vestibule, side entry zipper, rainfly kickstand vent, adjustable rainfly, adjustable integrated stake-out loops, durable high-tenacity nylon fabric, reinforced infinity bar tacks & lap-felled seams, Durashield™ coated rainfly & bathtub-style floor, compression stuff sack with pull handle. Best Use: Camping, backpacking, hiking, mountain biking, outdoor recreation, survival kit. Description: The MSR Hubba Hubba NX 2-Person Tent was made for backpackers who need an ultra-lightweight, yet ultra-durable tent. Made large enough to sleep two adults, it is as efficient outdoors as it is easy to carry. Optimized for space with symmetrical geometry, the Hubba Hubba NX is your ideal travel tent! Perfect for all seasons, this freestanding backcountry living space is a place you’ll be happy to spend your recreation time in. Featuring maximum space with additional head and elbowroom this tent was intended for comfortable livability with built-in rain gutters, and adjustable cross-ventilating rainfly. And it all fits in a convenient stuff sack with pull handle so you can take it wherever you go! Related: MSR Minimalist Shelter and Wings, Backpacking Tents, All-Season Tents, and Tent Accessories. Specific Features: LED lightbulb, red & green night vision modes, 250 lumens, 80 meters of maximum light beam distance, multiple brightness levels, IP67 water & dust proof, and PowerTap technology for easy transitioning between power & proximity modes. Best Use: Backpacking, camping, hiking, ice climbing, running, night skiing, and tactical. Description: The Black Diamond Storm headlamp is an improvement on the original design. Made with an unprecedented 250 lumens of power, the Black Diamond Storm is a revolution in lighting for climbers, mountain bikers, snowboarders, and other outdoor enthusiasts. These ultra-bright headlamps are ideal night lamps for hunters and make great camping gifts for anyone in your life! Specifically engineered for rugged adventures, the Storm from Black Diamond was redesigned with PowerTap Technology so that changing from full to dimmed power settings can be done with one tap of your finger. Includes both red light mode and green night vision mode for added versatility. Specific Features: Lightweight (only 2 ounces), micron absolute hallow fiber membrane inline filter, attaches to included drinking pouch, disposable water bottles & hydration packs, and is even easy to drink water directly from a running source, removes 99.9% of all bacteria and 99.9% of protozoa, filters up to 100,000 gallons, includes cleaning plunger. Best Use: Backcountry travel, camping, hiking, biking, overnight trips, emergency preparedness. Description: The Sawyer Products Mini Water Filter is a compact travel water filter attached to a 16-ounce eco-friendly pouch. To use it, just screw the water filter to the pouch, or onto the re-useable water bottles you already have – no adapters are required! Drink water from any freshwater source including lakes, rivers and streams and sip from the drinking straw. It has been tested & approved to remove 99.99999% of all bacteria including salmonella, cholera, and E.coli. Also removes 99.9999% of all protozoa including Giardia and cryptosporidium. This is the highest-quality point-of-use water filter on the market today, and it is the perfect gift for hikers. Related: The Sawyer Mini, PointOne Personal, PointOne Hydration, PointOne All-in-One, Water Bottle Filter, and the Complete Filtration System. Specific Features: Compact, rugged & sturdy, the world’s most trusted multi-tool brand, made in Switzerland, the perfect companion for cyclists, includes 8 bits for the most common types of screws, stainless steel adapter, L-wrench for rapid work, tire lever made of impact proof plastic. Best Use: Cycling, skateboarding, snowboarding, outdoor travel, recreation, camping, and emergency preparedness. 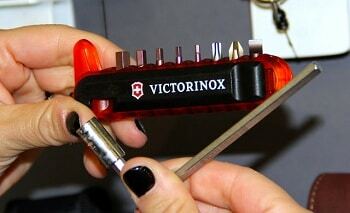 Description: The Victorinox Bike tool brings Swiss precision right into the palm of your hand. Made with all of your roadside assistance needs in mind, this tool won’t weigh you down, but still contains everything you need including eight bits for the most common screws, stainless steel adapter, two tire levers, and an L-wrench. This is the latest from the Swiss Army Knife collection and makes a great gift for the bike rider in your life. Also one of the best gifts for campers as it is one of the most versatile mini-tools available. Specific Features: Double-stitched seams, fully tape sealed construction, Ultra-Sil® high strength & lightweight CORDURA® brand fabric, UltraSil® fabric & Hypalon® roll-top for water-resistant performance, reflective compression lacing system. Best Use: Backpacking, camping, air travel, biking, and commuting. Description: The Sea to Summit Ultra-Sil Dry Day Pack is made from an exclusive siliconized CORDURA® fabric making it ultra-lightweight and durable. This daypack is also made water resistant and comes with a tiny stuff sack keychain sized) that also includes a key ring attachment. Double-stitched and sealed with high-density polyurethane seam tape, it also includes a non-wicking roll top that creates a reliable seal. Also includes elasticized compression lacing for extra storage. Related: Sea to Summit Ultra-Sil Dry Sack, the Carve 24L Daypack, Ultra-Sil Day Pack. Specific Features: 100% easy-to-clean, durable design made with nylon, super stuffable for storage, front and back carry options for kiddos 15 – 45 pounds, sleeping hood shields baby from sun or rain, shoulder straps comfortably fit heights 5’0″ – 6’3″, waistband range reaches 25″ – 58″, body of carrier rises 16″ to safely support your child as they grow. Best Use: Travel, camping, hiking, on-the-go parenting. Description: Lightweight and stylish, the Boba Air Baby Carrier is ready to go places! Made ultra-compact for Mom’s and Dad’s who like to travel, this baby carrier keeps children close, and stores away in just seconds. Folds away into a self-storing pouch that stashes in any diaper bag, carry-on or glove compartment so you always have access to a supportive child carrier that won’t weigh you down. But is it durable? The answer is, “YES!” Designed to resist rips and tears, it is made with nylon material. Rigorously tested for safety of all carrier components. For children 15 – 45 pounds. Related: Boba Wrap, Boba 4G Carrier, and the Boba Mini. Specific Features: Two full-range drivers, built-in bass port, Bluetooth® wireless, 3.5mm aux input, USB charging port, rechargeable battery, more than 12 hours of playback, built-in LED indicator. Best Use: Camping, overnight travel, campfires. Description: JBL Charge Portable Wireless Stereo Speaker and Charger with Bluetooth delivers exceptional sound and 12 hours of playback time that you can take anywhere! Made with a high-capacity 6000mAh Li-ion (lithium-ion) battery, you can re-charge the portable speaker whenever you need more power with the built-in USB port. This wireless speaker works with any Bluetooth equipped smartphone, laptop or tablet so you can enjoy audio with better performance than most mobile devices can offer. Bring full-range sound and crystal clear bass into your outdoor lifestyle. The JBL portable speaker is compact and able to play in both vertical and horizontal positions. An audio powerhouse ideal for outdoor gifts. Related: Charge Portable Wireless Stereo Speaker and Charger with Bluetooth, Flip 3 Splashproof Portable Bluetooth Speaker, and the Charge 2+ Splashproof Bluetooth Speaker. Specific Features: Battle tested for shock – water, sand proof and functional from -50ºF to +150ºF, seven tritium micro-lights allow for navigation in low-light conditions, magnifying lens, sight wire & dial graduations in both degrees and mils for accurate readings, copper induction dampening system, built-to-last aluminum frame, waterproof housing, carrying pouch, lanyard, belt clip,”3H” stamp on back, made in the U.S.A., tritium illuminated for use in complete darkness. Best Use: Outdoor travel, hiking, camping, navigation, sports, fitness, recreation. Description: The U.S. Issue Mil-Spec Tritium Illuminated Aluminum Military Lensatic Marching Compass has been officially assigned for use by the United States military. Used by U.S. troops, law enforcement and special forces units, this illuminated aluminum lensatic compass provides readability in total darkness, without the need for an external power source. This compass is the #1 military compass, also used by foreign troops and was engineered to meet the specific demands of fighting forces. Includes carrying pouch, lanyard and a convenient belt clip. The most rugged, accurate and reliable compass on the market. Includes a sapphire jewel bearing, and rotating bezel. Specific Features: 10 powerful white LED lights, 3 settings: bright, super bright, 1 second flashing, extremely durable, inflatable, collapsible, lightweight (weighs only 4.4 ounces! ), fully waterproof (IP67 rating), no additional batteries needed, charge indicator. Best Use: Home, study/reading light, backyard, patio, garden, travel, outdoor work, backpacking, paddle boarding, décor, yoga/spa room, mood lighting, climbing, kayaking, storm/emergency preparedness. Description: The Luci Original Lantern from MPOWERED is an extremely lightweight and versatile portable light. Take it on any adventure and this completely solar powered light will shine wherever you need it. The perfect addition to your survival or emergency kit, this light works when you are off the grid. Built rugged and waterproof, this light collapses flat to 1 inch so it is easy to store in your backpack during the day. Also a wonderful way to add mood lighting to your patio, or other outdoor space for entertaining friends and family. No batteries needed to charge the LED lights inside the lantern – just set the lantern in direct sunlight for 7 hours and the Luci Original will last 12 hours on a single charge! Versatile all-purpose light makes a great outdoor gift for anyone. Related: MPOWERED Original, Outdoor 2.0. Specific Features: Ranges up to 23 miles in mountain, valley, open water and neighborhood areas, safety certified (IP-51) for dust and protection from dripping water, 22 channels each with 121 privacy codes, 10 call tones, 11 weather channels with alert feature, USB charging, 14 hour alkaline or 12 hour NiMH batteries, includes 2 radios, 2 belt clips, 1 dual charger, 1 charging adaptor, 2 rechargeable battery packs and a User Guide. Best Use: Outdoor travel, backpacking, hiking, trail running, backcountry skiing, snowboarding, camping, emergency preparedness. Description: The Motorola Talkabout MH230R is the perfect gift for outdoor enthusiasts! This must-have communication device delivers reliable talking ability up to 23 miles. Ideal for when you are in the backcountry, off the grid, on a trail, or even just a few tents away from your best friend. The MH230 two-way radios don’t just deliver exceptional range; they also are able to give you reliable, real-time weather updates so you can always expect the unexpected. The MH230R is hands-free communication you can count on. Related: Motorola MH230R and the MH230TPR models. Choosing the right gear for an outdoor adventure is so important. It can make a BIG difference in the outcome and overall experience that you have with your friends, family or even alone. Don’t risk the quality of your camping trip by purchasing the wrong gear or a low-quality item that may or may not be worth the money. Start with these highly recommended outdoor gear essentials, and later you can also add more comfort and convenience to your time outdoors with other items like cooking utensils, sleeping bags, and possibly even an outdoor shower. The options are limitless! The best camping gear gift ideas get harder to find closer to the holidays. Beat the crowds and pick up one (or all) of these fantastic gifts for the outdoorsmen and women in your life. All of them are available for purchase online so you can stay home from the mall this year and enjoy spending time with the ones you love. This year, give outdoor gifts they’ll recommend to their friends, from this list of the 10 best camping gear gift ideas.